What China is doing to reverse Inflation trends is they are coming out into the world and are going to become the Producer at the Location of the resource and by holding their currency value low they can drive the cost down to produce , so wages trend lower so how does a consumer driven market recovery evolve in this general trend of wage decline in the Higher valued markets of the world like the USA ??? A Conversation about America on the Decline because its Trapped in a Trade Policy thats made it Dependent instead of Independent ….. I pulled the wage scale off this site and that other Info I got from this site too . I heard Beck has a Research Group hired that is like 100 plus people looking for this stuff to chart the trend America is heading in . I question if this Globalism and International market effort is working out for America any longer ??? Why is it that there is Value for the Chinese to come to America and develop this , but there is No Value for Domestic Americans to develop this and sell it to the Chinese ??? Chinese national company is interested in developing a 10,000- to 30,000-acre technology zone for industry, retail centers and homes south of the Boise Airport. Officials of the China National Machinery Industry Corp. have broached the idea — based on a concept popular in China today — to city and state leaders. Hoku Materials Inc., a subsidiary of a Chinese energy firm, already has 500 people building its $400 million plant to make polysilicon for solar panels in Pocatello. It expects to begin production in 2011, employing 250 people, said Scott Paul, Hoku’s president and CEO. I watch both AUD and CAD against the dollar and it is interesting they are both hovering around parity as we start 2011. In terms of the Aussie dollar, I think the recent flooding in the country could have major economic implications and may help to curtail the strength of its currency. 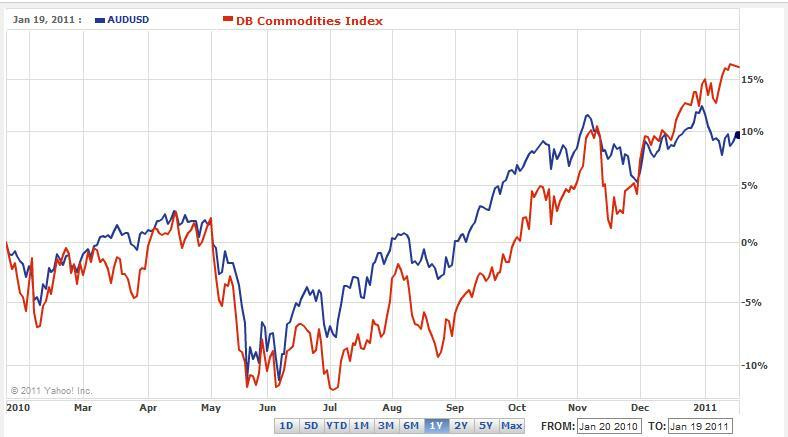 The Chinese economy will crash in 2011, and so will commodities and the AUD. Something that can’t go on forever, won’t. There are so many measures of China’s unsustainable investment boom that no further evidence is required, given that Chinese authorities are trying to pop their own bubble is the best piece of evidence. Sadly you can’t pop a bubble carefully, however well intentioned you are. When it pops, the stuff goes everywhere in all directions. Try this at home with a soap bubble if you don’t believe me. The AUD/USD has continued to trade with in its .99/1.02 range and I think that it will continue to do so until the commodity markets really run out of steam. The Chinese inflationary environment is going to be very interesting to see how it plays out. Increasing borrow costs and th e Reserve ratios at the banks seems to be having little effect as yet. The one thing that will work is if they are forced to appreciate the Yuan faster than the gradual pace we are currently seeing. In the meantime the US will do anything and everything to maintain a weak USD, it was not too long ago there was massive fear about deflation in the US, they are going to fuel this economic recovery until it has scary momentum. The Employment situation has only now just started to improve. I would not expect anything in the way of cash rate hikes in the US in 2011 and probably not until mid 2012. But when they do, watch the fire works because that economy will be spring loaded and they will have to hike rates aggressively.